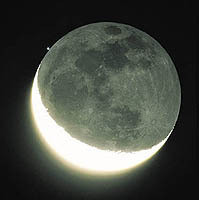 An occultation is a celestial event occurring when an astronomical objects apparently hides another astronomical object. The nearer object completely covers the more distance object. A transit occurs when the nearer object appears smaller than the more distant object. For example, the transit of Venus across the Sun in June 2004. 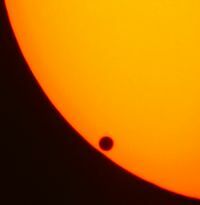 The next transit of Venus will occur on June 6th, 2012. The transit of Venus across the Sun in 2004. Eclipses generally refer to events when an object moves through the shadow of another object. Such as the Moon moving across the shadow of the earth in an eclipse of the Moon, the Moon is said to be eclipsed by the Earth's shadow. 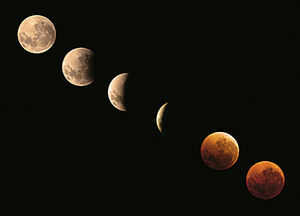 A serie of shoits showing the Moon eclipse. 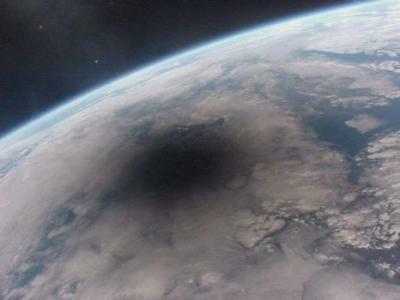 An solar eclipse is a sub kind of occultations: indeed, only a part of the earth is hidden.